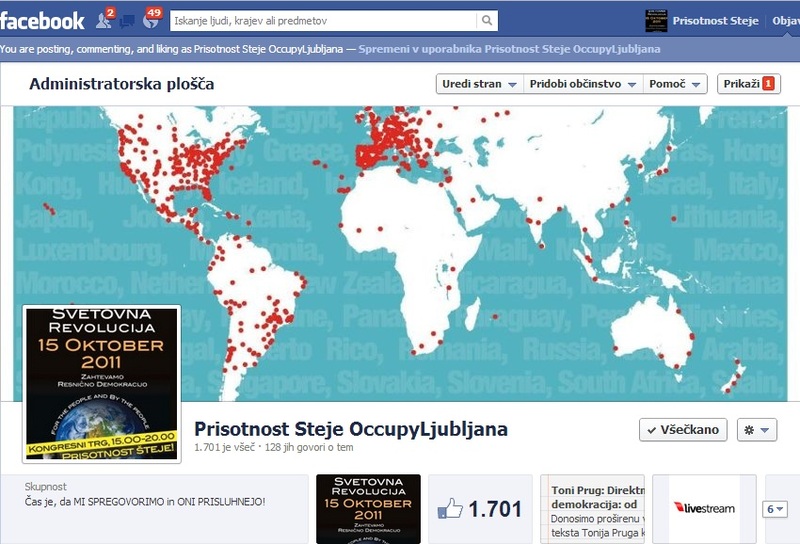 Presence Counts · 15o · OccupyLjubljana | Čas je, da MI SPREGOVORIMO in ONI PRISLUHNEJO! Originally published by Enough is Enough. Written by Riot Turtle. I woke up in the morning with the news of the clashes on Lesvos. The islands are about to explode because most refugees are kept on Lesvos and other Greek islands. Lesvos is totally overcrowded, about 8000 people live in the Moria camp, which officially has a capacity of 2000 people. I received some videos of yesterdays violence on Lesvos, some people got severely injured and are in critical condition. That was the first thing I heard and saw this morning. And for what? As I wrote in the introduction of this article: There is no wall or fence that will stop people from fleeing from war and persecution. I am in Velika Kladuša now, a small province town at the Bosnian side of the Bosnian-Croatian border. Velika Kladuša has a long history. It was a frontline town during the war in the times of the Osman empire and it was a frontline town again during the Balkan wars in the 1990’s. In this town many locals know what it is to flee from war and persecution. When the first refugees arrived locals immediately started to help the new arrivals. There are some international volunteers here, but most of the work is done by local people. Refugees eat in a local restaurant. It was good to see that people got their meal served on plates and on a table. Not in plastic cups like in many state camps on the Balkan route. The owner told me he opened the doors of his restaurant because he personally knows how it feels to be forced to leave home, friends and family. He had to leave his own home during the Balkan wars. We are working with local people and a few international volunteers here. Bosnia is not exactly a rich country but people do what they can. Refugees told us that locals come to the makeshift refugee camp every day. They bring food, shoes and clothes. The international volunteers support the locals in the restaurant and started a warehouse to collect donations. They also work together with Doctors without Borders (MSF). Organize medical support and installed showers, wash clothes etc. etc. The list what have to be done is long and new people are arriving every day. The Bosnian state can’t handle the situation, the economy is weak and there is no strong infrastructure that could handle the high number of daily arrivals. Although locals and international volunteers do what they can to support refugees here, there is a lack of about anything. Therefore it would be great if people would help to support refugees here with donations. There are enough people supporting refugees here but they need financial support to continue their work with refugees. You will find donation details below. Name of account holder: Hopetal e.V. Tonight we will travel with people of the Cars of Hope collective to Bosnia. We will hook-up with our friends of the former Soul Food Kitchen. We worked with Soul Food Kitchen before (in Thessaloniki and Belgrade). Here is an article about the situation at the Bosnian-Croatian border. Locals together with international volunteers are warmly welcoming people at the Bosnian-Croatian border and are trying their best to support them and show solidarity. Originally published by Are You Serious. At the “Kod Latana” restaurant, close to the city center, a group of local people and volunteers of the former Soul Food Kitchen provide a free meal daily. At first, locals were financing everything themselves. Donations started coming in recently, mostly through the small Bosnian charity pomozi.ba, supported by local population and companies, but also personal donations. During Ramadan, when two meals are served each day, and with the increasing number of people, this help is more then needed. International volunteers recently began coming to Kladuša, too. A warehouse for distributing donated clothes and the NoName Kitchen’s (WARNING: Facebook link) mobile showers were set-up. Image: Impressions from the restaurant. Image: Testimonies of phones allegedly destroyed by the Croatian police. Image: People unloading their belongings at the field. Image: The park after the eviction. The Balkan route took a new turn , more than 3000 people came to Bosinia since January. On Saturday Riot Turtle will travel to Bosnia with people of the Cars of Hope collective. After almost all European states closed their borders, the Balkan route once again took a new turn. European state leaders seem to think that walls and fences will keep people away, but they underestimate the creativity of human beings. They only thing the policies of European governments produce is more suffering and more deaths. More than 3000 peoplecame to Bosnia since January. From Greece more and more people pass through Albania, where autorities normally don’t register people after they arrived. From Albania they move to Montenegro. Are You Syrious (AYS) reported earlier this month that a Small local feminist activist orgaization Bona Fide in Pljevlja, Montenegro, provides support to those who are travelling. This small local group started helping people who were crossing through their city in February this year. “We noticed a group of young men one evening, and after we approached them we learned that they are coming from Syria, over Turkey, Greece, and Albania,” Sabina Talović from Bona Fide told AYS. Most people leave Montenegro again and travel to Bosnia. The other route for people to enter Bosnia is from Serbia. Some of them come from camps in Serbia, but most people come from Bulgaria and only crossed Serbia on their way to Bosnia. For most people it’s getting increasingly hard to get to northern Europe. The massive police violence of the Croatian police at the border with Serbia and Bosnia continues. In Saturday May 26th I will travel to Bosnia with members of the Cras of Hope collective. We will organize and support already existing mutual aid for people in Velika Kladuša at the Bosnian/Croatian border. But I will also report about the situation there. We will distribute food, clothes and other things people need for their daily life. Especially during the Ramadan a lot of support is needed. Local people from Velika Kladuša and two activists that worked before on other spots at the Balkan route, cook and serve hundreds of meal every day after sunset. The fasten-break or Ifthar is more than just eating for many people. The number of people continues to grow and the inititiatives are running out of money. In Sarajevo, mostly locals are helping to all those who are arriving daily. Every kind of help is needed medical, food, clothes, shoes…Volunteers are needed too, including doctors or nurses. If you can come to Bosnia, please get in touch with Are You Syrious. Originally published by Are You Syrious. On Friday evening, over 40 people entered Bosnia from Serbia, mostly families with children. For now, all of them have been placed in a local hostel paid for by the local volunteers in Sarajevo, but soon they will be moved to Delijas, the only existing asylum center. They will be forced to stay at this center in the mountains, where they are not given adequate food or any kind of help, far from the city. It is a twelve-kilometer walk to the closest gas station where they have a phone and an internet signal. No volunteers are allowed into this center. Nevertheless, groups of local and international volunteers are trying to help all the people who are arriving daily in Sarajevo. Several hundreds are now on the streets since no shelter has been provided by the government, UNHCR or any organization that exists in the country. The only available help is coming from the small, local groups of international volunteers. Two groups that are working in Sarajevo need your help. One is Pomozi.ba, a local charity that supports volunteers in the field. The volunteers are working to provide accommodation for all, giving priority to the mostly vulnerable people. So far they are taking care of about 300 people, but many are still on the streets. Locals are also providing food, medical help, clothing and everything else. But they desperately need help to continue working, while the number of people who are arriving is increasing every day. If you want to volunteer in Bosnia, please get in touch through the AYS inbox on Facebook. Experienced volunteers only. The other group (Warning Facebook Link) are international volunteers who are working at a private property with a local family who has offered shelter for about 80 single men. But every day new people are arriving and they are struggling with financing food, blankets, and other essential items. I didn’t think long when Luka (name changed), a Slovenian comrade and good friend, wrote me in September 2015. I was planning to drive to the Netherlands for a few days but I immediately changed my plans and drove to Slovenia the next morning. I first met Luka and we discussed the situation. Luka proposed to document it all and spread it through our independent media channels. I drove to Bregana at the Slovenian/Croation border and the first thing I saw was a lot of riot cops and military. Helicopters in the air, armoured vehicles, shields, helmets and batons. The full program. 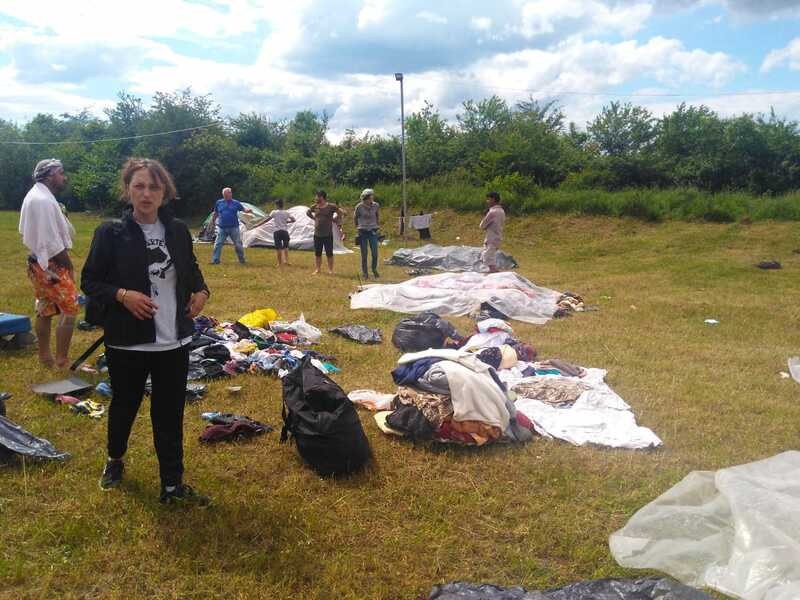 A group of people was sitting on the ground on the so-called no man’s land, a small territory between the Slovenian and Croatian border posts. I started to talk with people and asked if I could take some pictures. They agreed and so I started to document the disgusting scenery. A totally militarized border to stop people from seeking refuge. During the night that followed people again and again asked to let a sick child pass the border. On the Slovenian side of the border was the nearest hospital. But the cops refused to let her pass and in the early morning hours the child died. I wiped a few tears, and got sad and angry at the same time. 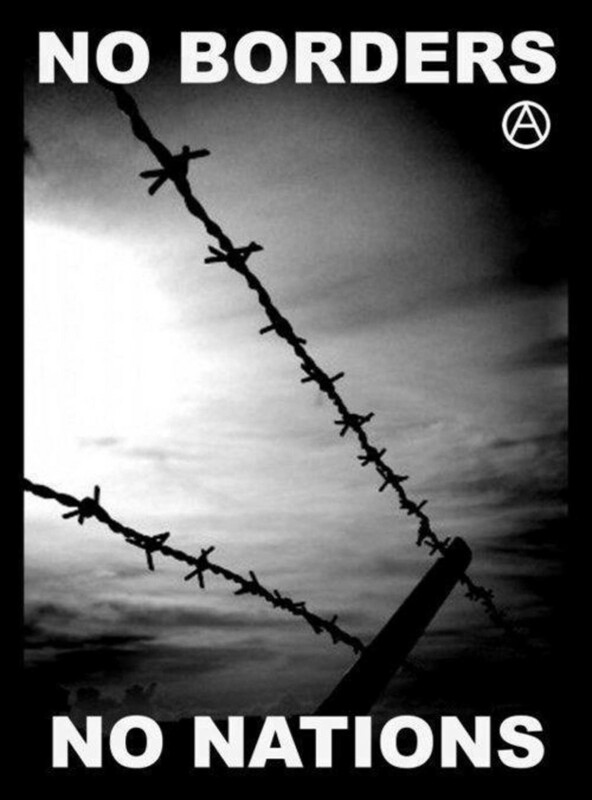 Borders kill! The Slovenian ruling class didn’t mind to let these people suffer and refused the necessary treatment of the sick child, but they seemed to be stressed about possible bad publicity after the child died. The image of their state could suffer. A few hours later suddenly coaches parked at the border and Syrian families with children were allowed to pass the border to get into the coaches. All refugees protested, including the ones who were allowed to get to the coaches. The solidarity between all people on this tiny piece of land was inspiring. Nobody knew where the coaches were bringing these people and together with some other people I decided to follow the coaches. We discussed who would stay at the border with the people who were still there, to make sure that enough people would stay. In the beginning it looked like the coaches were only accompanied by one police car, but soon the first of our cars was stopped by state security in a civil cars. Soon the second car was stopped and I decided to take a bit more distance. I managed to follow them a long time but a few kilometers before Maribor I lost them. I circled around but didn’t find the coaches again. A little bit later I heard that the coaches had left Slovenia and crossed a small border post. The coaches were in Austria now and I decided to drive to Austria. I drove to Heiligenkreuz at the Austrian/Hungarian border and met a few comrades. Thousands of people arrived here and it was a pretty chaotic scene because the Austrian army and cops had surrounded them on a small piece of land. But little by little people were transported to different Austrian cities and to Germany. During my stay in Heiligenkreuz we (me and some comrades) heard that Hungarian cops started to chase and arrest refugees on the Hungarian side of the border. We mobilized more people and drove to the Hungarian side of the border. We saw that the information that we received was correct and started to act. The Hungarian cops tried to arrest as many refugees as they could. It was the implemenation of a new law of the fascist Orban regime, which allowed the Hungarian state to detain people up to 3 years for illegally entering Hungary. For obvious reasons I can’t write about what kind of actions took place during that night but somehow many people arrived in Austria and were save for the Hungarian cops. I was able to sleep a bit in the car and a few hours later I drove to Salzburg, Austria. Around the main train station I saw soldiers patrolling with machine guns in their hands. Many people were sitting on the ground at the main train station. Waiting for things to come. All trains to Germany were cancelled. A few kilometers from the main train station German riot cops closed the Austrian/German border, only letting in a certain amount of people per day. I drove back home after that, with a head full of images. But soon I was back on the Balkan route. We organized a convoy to Slovenia, Croatia and Serbia about 1 month after I returned to Germany. The Cars of Hope collective was born. The misery on the Balkan route was getting bigger and bigger. More and more European states were sealing-off their borders with military, cops and fences. 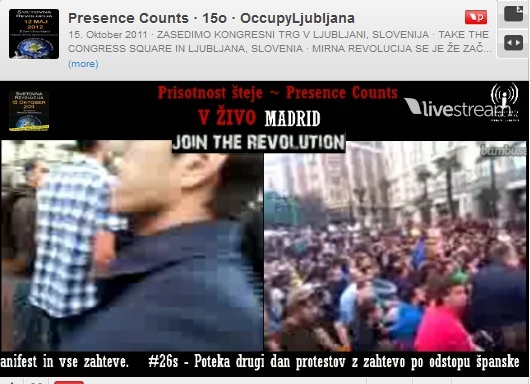 The scenery in state-run camps like Opatovac (Croatia), Šentilj and Dobova (Both Slovenia, video below) was similar. People were treated more than just inhuman. They were subject to police violence and terrorized. I can still here Croatian cops screaming “One line!” in Opatovac. Even mother and children were only allowed to walk behind each other in a line. “One Line!” I decided that I was not going to support the scum that created these camps by working there. I documented (which was forbidden) the situation in Opatovac and left again. I drove to Serbia and started to work there on a rest area along the highway from Sid to Belgrade. There we were able to work self-organized. People were allowed to move and we build-up a mobile charging station for smartphones. Smartphones were crucial for many people as they often lost friends or family on their long journey… For me it was important not to get exploited for the goals of state rulers, but to work in a self-organized structure and on eye-level with people. Also when it comes to decsion making. After that I went many times on the Balkan route with the cars of Hope collective. We worked with Soul Food kitchen for people who were sleeping in the streets and parks of Thessaloniki (Greece), with Soul Welders in Belgrade (Serbia), with No Border Kitchen Lesvos (Greece) and many others. We also worked a lot in Idomeni (Greece) and organized appartments for many people after the “wild” Idomeni camp was evicted. But we also did a lot of presentations in many German cities to create awareness about the situation of refugees on the Balkan route. Many activists of Cars of Hope also fight deportations in Germany and are involved in demonstrations and other actions for the freedom of movement. The EU/Turkey deal from March 2016 is a disgusting deal which caused more deaths and legalized trade with humans. The European Union and its member states are paying the Turkish state billions to keep refugees out of Europe and if people do manage to reach the European Union, the EU member states can deport them back to Turkey. But Erdogan’s authoritarian Turkish state wasn’t enough for many EU member states. An even more down-and-dirty deal was made with Libya. A country where people are put in camps that are even worse than in Europe. The European Union is doing business with a country where refugees are being sold as slaves. The year 2017 is coming to an end I will travel on the Balkan route again. This time to Lesvos and Athens, this time for almost a month. We still have states and borders, we still have people dying at sea and at inner European borders. I will continue to fight for peoples rights like the freedom of movement and also support people who are seeking refuge as much and as good as I can. It makes no sense that people like me are priviliged and can travel wherever they want to just because I was born in northern Europe. I absolutely didn’t do anything that justifies this kind of privilage in comparison to people that were born somewhere elso on this planet. All people have the right to the freedom of movement. The continent that colonized large parts of the world, that is making money by selling arms to war zones, that is crushing out peoples basic existence with trade deals that destroy local economies around the globe, has closed its borders. We have to overcome this kind of policies, we have to overcome states and borders. We have to get rid of an economical and political system that is dividing us and that destroys our planet. On Lesvos we (the Cars of Hope collective) will support the Open The Islands campaign, just like we did in the Vohwinkel district and the university of Wuppertal, Germany. For me personally thats not enough, but its a first step towards a real freedom of movement.